The Grill Station combines a charcoal grill with table space to use for prep work or serving. This design eliminates the need for separate components. Now the two are one, and much more convenient. 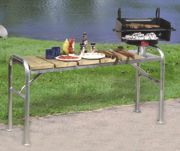 Grill Station features include: welded steel frame with a maintenance-free galvanized finish; work area measuring 20 inches wide by 48 inches long; tabletop of limber or colorful recycled plastic planks; your choice of nine different Pilot Rock grills. Every park should have a rustic swing made of natural Northern White Cedar. These feature traditional styling, a smooth-sanded surface and rust-resistant coated hardware for years of enjoyment without maintenance. The 4-foot American Garden Swing features an elegantly styled Fan back. Take a seat in the 100 percent recycled plastic Adirondack Chairs. An eco-friendly twist to a timeless favorite, these classic chairs are available in five different colors, feature a higher seat height for easy seating and have a contoured back for added comfort. Made from the highest grade recycled plastic, these durable lounge chairs are virtually maintenance-free and will look perfect lining the walkways or pool of your outdoor area. Matching side table, ottoman and tete-a-tete also available. Petersen Manufacturing Company Concrete and Metal Site Furnishings can provide the strength, flexibility and aesthetic value necessary for any commercial or residential projects. Choose from many styles of planters, bollards, tables, trash receptacles, ash urns, barriers and drinking fountains. Whether you need one table or hundreds of planters or barriers for crowd control, Petersen can meet your needs. Custom colors and decals complement your design scheme or promote your school colors. Labels and unique offerings encourage proper recycling of materials. The Galaxy Collection allows for flexibility in placement and configuration to meet your recycling and trash requirements. Receptacles come in three different sizes and two different colors for fast delivery and are designed for durability and ease of maintenance. Witt Industries is a leading woman-owned manufacturer of a line of quality waste receptacles, ash urns and recycling containers. Founded in 1887 in Ohio, Witt Industries has supplied receptacles to major stadiums, universities and national parks, including Mount Rushmore and the Office of the President at Camp David. Pictured is the Witt Oakley, a decorative, value-priced container that comes with a five-year workmanship and three-year paint warranty. Maintenance-free heavy-duty square picnic table by Gerber Manufacturing. Recycled plastic top and seats with choice of green, tan or gray colors. Hot-dipped galvanized steel frame, which is galvanized after fabrication for maximum durability. Green and brown painted frames are also available. Other options include lumber or aluminum for the top and seats. Stainless steel hardware is standard with the plastic. One hundred percent recycled rebar of varying sizes is used to create BRP by bison's latest collection of park benches, receptacles and bike security stations. The Urban Renewal collection features a unique, city-centric style, designed to complement inner city, downtown or uptown revitalization and re-commercialization projects. Coordinate the look by combining backed and backless benches, bike racks, planters and recycling, litter and ash receptacles, all with lifetime functional warranties and 10-year finish warranties.